In our workshop in Guildford, Surrey and our factory in the South East, Peper Harow Horse Boxes in Surrey build a range of coach built and conversion lorries to suit the needs of the driver, rider and horse. Adding on additional features, either in the build phase or to upgrade older horse boxes means your horse box can be continually adapted and improved based on your requirements. With a smooth and enjoyable sales experience and finance available if required, we sell a range of brand new and second hand horse boxes from our office in Godalming, Surrey and workshop just outside Guildford. The team in the office and workshop help our customers to understand the different options available when it comes to buying a horse box. This helps you decide what type of horse box you want and what extras fit your needs. Peper Harow Horse Boxes also sells on behalf of our customers on a 10% commission basis (plus VAT). We can achieve the best price for the seller and provide peace of mind to the buyer in the knowledge that our workshop team has checked over all elements of the construction, electrics and appliances. We valet the vehicle, advertise it with good photos and detailed descriptions, handle viewings and send the proceeds once sold. 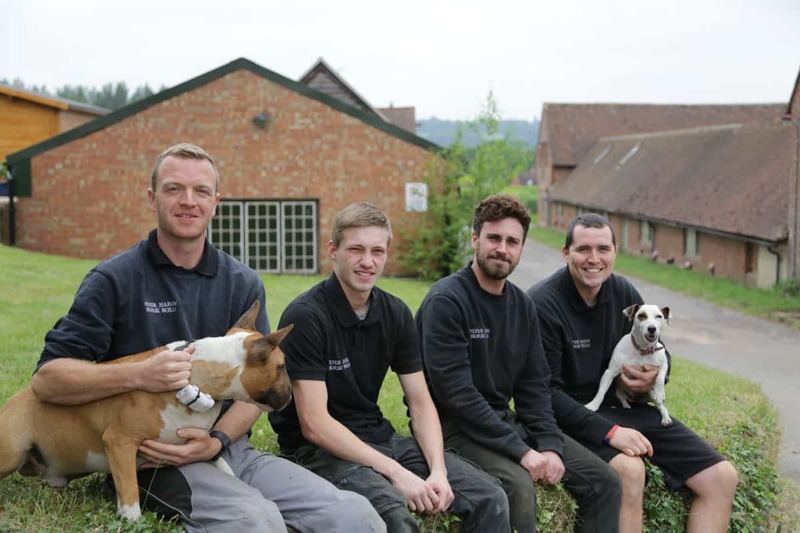 The team in our workshop in Shamley Green just outside Guildford works closely with our customers to maintain the mechanics and bodywork of your horse box or horse trailer. Booking in for yearly servicing and MOT or plating also allows the opportunity for repairs, upgrades and checks. Insurance work is also completed in the workshop, where we liaise directly with your insurer. Julia McNeill founded Peper Harow Horse Boxes in the early 1990’s. She is still heavily involved in all aspects of the business and leads on the sales of new horse boxes. As a horse rider herself she understood the need for safe and functional horse transportation. This led her to design her ideal horse box, specifically designed to be easy to drive. Our best-selling Trophy Twin horsebox is based on Julia’s initial design, though with some modifications and modernisations over the years. The business built up slowly, offering other services such as mechanical repairs and horse box refurbishment, resprays, servicing and testing. In 2000, Julia’s son Adam joined the team. He supported the business by coach building new horse boxes, completing refurbishments and buying and selling horse boxes. Supported by his Workshop Manager Aaron, Adam runs the yard in Shamley Green, just outside Guildford. Here, he and his experienced team of mechanics, welders, coach builders and carpenters take care of servicing, repairs, breakdowns, sales and building of new horse boxes. At Peper Harow Horse Boxes we strive to offer the very best customer service. We always keep you informed and act with honesty and integrity as we want happy customers and a happy workforce. We understand how important it is for you to be able to speak to someone to ask questions, get advice or understand what the options are for buying, selling or repairing your horsebox. You can call Julia, Adam and the rest of the team directly. If the phone is not answered, please always leave a message and your call will be returned. Email and Facebook messages are also monitored and returned as soon as possible. Julia, Adam and the rest of the team are very happy to meet with customers to discuss and provide quotes. This could be for a refurbishment, adaptation or plan for a new build. We will work within your budget to achieve what you desire. We then book in the work or build and provide a timescale for delivery.